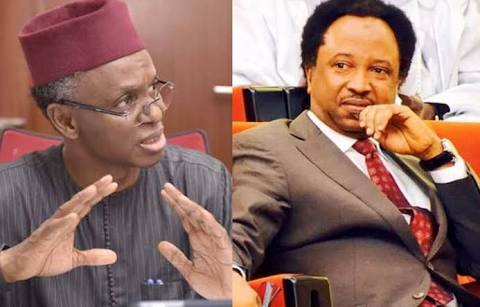 The Governor of Kaduna State, Nasir el-Rufai, has warned President Muhammadu Buhari that there would be serious consequences if the senator representing Kaduna Central, Shehu Sani, should win a return ticket to the red chamber in 2019.
dated October 2, titled, ‘Forwarding of a compendium of Shehu Sani’s denigration of President Buhari, the APC and the Governor of Kaduna State’. The governor chronicled the activities of the Kaduna State senator since he was elected into the Senate and concluded that Buhari’s Presidency between 2019 and 2023, would suffer serious attacks from the National Assembly with people like Sani there. Part of the memo read, “I wish to forward to your Excellency this compendium of the serial acts of denigration and disrespect Shehu Sani has exhibited towards your person and office, our party and the government it produced in Kaduna State. “This compendium exposes the litany of disloyalty and disrespect of Shehu Sani. “He (Sani) accused the government of being corrupt: ‘When it comes to fighting corruption in the National Assembly and the judiciary and in the larger Nigerian sector, the President uses insecticide, but when it comes to fighting corruption within the Presidency, they use deodorants’." On the kidnapped Dapchi schoolgirls, el-Rufai said Shehu accused the Federal Government of faking the abduction and release of the Dapchi girls, quoting him to have said, ‘Since Dapchi has been turned into a Sahelian Tinsel town, then Steve Spielberg or Spike Lee or Jerry Bruckheimer of the Pirates of the Caribbean needs to visit, explore the possibility of a blockbuster’. The Kaduna State governor alleged that Sani mocked Buhari when the President explained, during a trip to Benue State, that the Federal Government handled the Dapchi episode better than Jonathan handled Chibok. According to him, Shehu Sani wrote, ‘The Spiderman, who couldn’t protect Chibok blasted by the Spiderman, who couldn’t protect Dapchi from alien invasion’. El-Rufai added that when the President travelled to London in April 2018 for medical consultation, Sani ridiculed the trip on his Facebook page, by saying, ‘Voyage to London; season 3’. The memo further read, “In September 2017, he (Sani) derided the security operation against IPOB, saying, ‘Deadly python dance in the South-East is provocative, unnecessary and should be stopped’. “In May 2018, he (Sani) lamented what he said was Buhari’s three years of failure to protect human lives. “In the same month, he wrote that ‘Baba should protect his testicles from any man who always bends to greet him’. El-Rufai said he would have heeded Buhari’s request for the recall of Sani sometime in January this year but for the huge cost such process would require. He said, “Your Excellency will recall that earlier this year, you directed me to initiate processes to recall Shehu Sani from the Senate, to punish his repeated acts of contempt and disloyalty. “The party executives in his ward in Kaduna suspended him from the APC in December 2015 for negative comments about your Excellency. It was later extended to indefinite suspension. “Following your directives, our team in Kaduna studied what was being done in Kogi State (then) regarding the recall of Dino and drew out a budget. Upon an examination of the cost and loopholes in the recall process as brutally exposed in Dino Melaye’s case, and in recognition of the imminent preparations for the next election, it was decided that it might be more prudent to oust him at the ballot. El-Rufai’s memo added, “Recently, we noticed unsavoury attempts at the national headquarters of the party to treat this same Shehu (Sani) as if he had been a loyal party member. The ostensible reason for the romance with this most disloyal and untrustworthy person was said to be the political arithmetic in the Senate. “The proponents of this immoral elevation of a traitor failed to acknowledge that Shehu Sani was the loudest among the irresponsible lot that were undermining the Federal Government and threatening the APC with defection. “When his collaborators began defecting (sic), he could not (do the same) because there was no place (for him) to go. The PDP in Kaduna State refused to guarantee him an automatic ticket. While looking for a new home, he pasted posters all over Kaduna without a party name or logo. El-Rufai added that the people of Kaduna State were not in a hurry to forgive Sani over the role he played in denying them the Senate’s approval for the $350m World Bank loan requested by the government of the state.